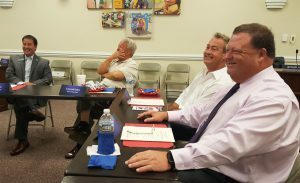 (Right to left) Superintendent Dr. Ross Renfrow, Clayton Mayor Jody L. McLeod, Four Oaks Mayor Linwood Parker, and Smithfield Mayor Andy Moore discuss the future of Johnston County Schools last Thursday at the Johnston County Board of Education Building. Johnston County Schools Superintendent Dr. Ross Renfrow invited county mayors to a special meeting to discuss the state of the school district. The superintendent shared the district’s vision for instruction in Johnston County schools, titled “JoCo 2020.” Dr. Renfrow also addressed any questions and concerns brought by the mayors. The conversation included the I-95 corridor of poverty, JCS facilities planning, growth issues, and modifications of older facilities. Mayors attending the special breakfast meeting included Mike Gordon of Archer Lodge, Jeff Holt of Pine Level, William Massengill of Benson, Jody L. McLeod of Clayton, Andy Moore of Smithfield, Cheryl Oliver of Selma, Linwood Parker of Four Oaks, and Don Raines of Princeton. Since becoming superintendent on March 1, Dr. Renfrow has focused on receiving stakeholder input and gathering the information needed to meet the needs of students in Johnston County.